When the kids get out of school for Christmas break there are always a few days of extreme boredom while waiting for Christmas day. 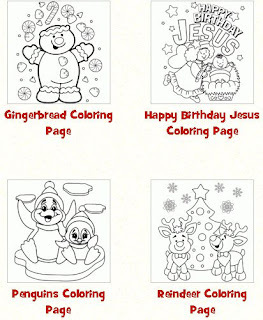 This site has a limited amount of coloring pages but they are completely adorable! I plan to print some very lightly. I have a setting on my printer where I can lighten the black to save on my ink. This is very helpful when you print a lot of kid stuff like I do. I do this with color pages and calendars so the kids can color and decorate them easily even if they are light they can still outline the picture then color it. This would also be a cute idea while they are waiting for Christmas dinner you could use coloring pages for a contest of who can be the most quiet. Okay so you may not want to call it that you might not get much cooperation. How about the 1st Annual Christmas Coloring Contest. The artist that is the most quiet and colors most of the picture wins and gets to have their plate first! That would be a really good prize right? Well either way I hope you have fun and enjoy the colors of Christmas time.